Posted byLance Wiggs	 September 4, 2011 7 Comments on Hey MPAA – so where can we buy Boy online? Commenter Jonathan Hunt pointed out in the last post that while the MPAA likes to complain about downloading of the movie Boy, he still cannot see it in iTunes 18 months later. He is right, and it seems the MPAA are well out of order. Here’s what I see from the New Zealand iTunes store. 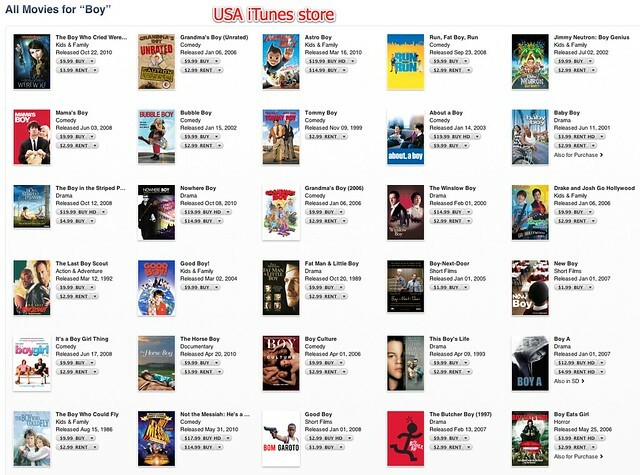 There are 18 movies found when searching for Boy, but not the March 2010 release Boy. Here are the US iTunes store search results. There are 45 results, getting on to three times the number of NZ results, and sadly still no Boy. This is a simple demonstration of much that is wrong with the retail side of the movie industry in New Zealand. The international content isn’t here, and our domestic content isn’t getting out there. In the USA you could buy the HD version of Astro Boy for $19.99 or the standard version for $14.99. You could rent Fat Boy run for $2.99 or buy it for $9.99. We cannot buy an HD version of Astro Boy, and our standard version is $17.99 (US$15.31) which is about right versus the USA’s $14.99. Neither store offers the movie to rent in any format. Run Fatboy Run is also $17.99 (US$15.31) however, which is 50% more expensive than the US price of US$9.99. The rental price of $4.99 (US$4.25) is also much higher than USA iTunes store’s US$2.99. So in general, and other experience backs this up, the amount of content is much smaller, the formats not as good and the prices higher, perhaps much higher. I suspect there is some value to be gained in being careful where you buy if you were shopping in both stores. Note that if you want to buy from a foreign iTunes store, then you can. Whether it is for movies, songs or apps, for personal use or, if you are in the business of iPhone and iPad development, for business, then follow the instructions posted here previously. This is way better than a brick & mortar esatlbimshent. Does the NZ price include GST. It looks like I don’t pay any sales Tax when I purchase stuff on the US version of iTunes. That could account for some of the difference. However given the production /transmission costs delivering the sales to NZ would be very low. One would think that to maximize profits the price would be lower to reflect the fact Kiwis have less income.